Welcome - About Live and Loud! Live and Loud! began as a fortnightly internet radio show taking old unreleased live concert recordings I could find and working to repair and improve them - fixing tape hiss, noise, tape drop out, clicks, speed variations, defects - before improving the sound quality by EQing the sound to bring out the instruments as clearly as possible. These are now made directly available to download for free to reach as many fans of the music as possible. Depending on the quality of the original recording, these can often be made to sound almost like commercial recordings - but of course I can't guarantee that for every show. What I can guarantee is it will sound far better than the original files available which have been floating around the internet and on bootleg recordings for many years. Almost all are either "soundboard" recordings taken directly from the mixing desk used at the gig on the night - or old FM radio recordings. A few gigs, if they are of special historical importance, make an appearance even if they were recorded from the audience. Do your ears a favour and listen on headphones or good speakers to get most benefit - laptop speakers will always sound pretty poor by comparison. All shows still available are listed, including a link to download the remastered show for free. If you want the shows in lossless format, or as separate tagged files, head over to the Rewards for Donations page and see how you can get a lot for very little! And finally... These are great fun to listen to but DO NOT replace original releases - support these artists and buy their music. There is nothing you can go and buy in a regular record store here. If a gig is made available as a regular release, then it will be removed (as a couple have been already). It's been a while since I did a Bowie show - long overdue! 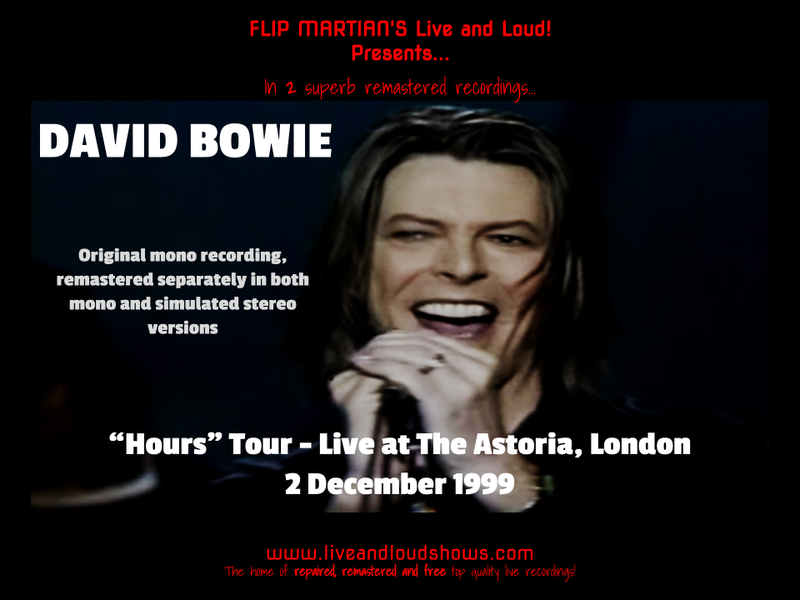 This is a great show from the short (but perfectly formed) "Hours" tour in 1999 with plenty of banter with the crowd from Bowie throughout, not to mention some great versions of songs. The source files were in rather dull and muddy mono - the text file with the lossless source files claimed it was a soundboard recording (I think it's either that or a mix from a video soundtrack). After transferring the files to 1 .wav file and sorting out a few clicks and some sound level variations, I decided to remaster the show in mono but then also to separately create a simulated stereo recording from the source files, then remaster that too. So this show has been done twice - once in mono and then again in stereo (just turning the remastered mono into stereo just wouldn't have sounded too good). So 30 band EQ came in useful on 2 separate occasions this time - each version needing handling differently to refine and clear up the bottom end and roll off harsh mids and upper frequencies, to bring some clarity to the mix (Sterling Campbell and Gail Ann Dorsey are now rather clearer in the mix than before). I think the results are more than worth it. For me, I think the bottom end is clearer in the mono version but the stereo version sounds "bigger" - in any case, both are here for you to download and see which you prefer! Or, if you would like to support the site with a small donation towards storage subscription and internet costs, in return you can have the show as separate, properly tagged MP3s or lossless FLAC files; head on over to the Donations tab to see how you can do this. Either way - enjoy the show! All shows are free to download of course! However, if you do wish to donate towards the site's running costs (even £1) you can get properly tagged and separated FLACs and MP3s for every show in return! Check out the "Rewards for Donations" tab for details. You can donate at this link. Thank you.